4/17/2009 — Today I succeeded where I mostly failed yesterday: I got pleasantly and completely lost. A few TWAAM episodes ago, one of their intrepid panelists recommended County Road 40 in the southwest metro. After some rather boring and un-fun highway miles on what turned out to be the wrong road, I finally intersected CR-40 and was not disappointed. It’s a fantastic 2-lane, winding, lazy road with a 55 mph limit and simply immaculate road surface. It’s completely rural. I passed barn after barn and a couple of aggregate quarries. Thankfully it only smelled like barnyard a couple of times. Nearly 45 minutes later, I was pleasantly presented with the quaint little town of Henderson. Not any too soon either, as I was down below half a tank of petrol. The ride back to EP was simply splendid. Gone was my distrust of the bike in a lean. 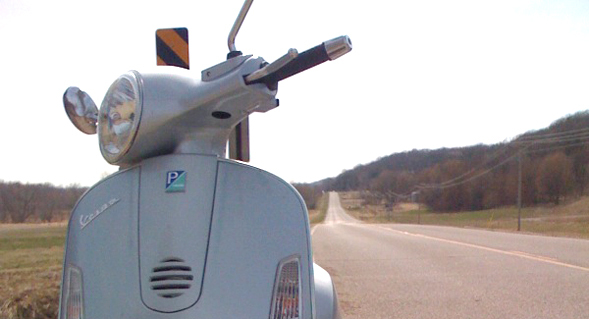 The Vespa and I were one and the countryside was ours. CR-40 was not only scenic, smooth, and winding, it was practically deserted. What little traffic I did see were full-fairing Harleys in small knots of three or five. What that really meant was that I could just cruise at a very comfortable 50 mph and take in the day. Fantastic. The one caveat to this otherwise fabulous ride is that it really made me long for a proper motorcycle. Even my 200cc Vespa GT didn’t handle the hills as well as I would have liked. For all its charm and capability, it’s a city vehicle. I think there’s definitely a Triumph Tiger in my future. Finally finding my true leaning mojo and just soaking up the miles. I felt like I could have just ridden for the rest of my life. The wobble continues, although now it seems to have restricted itself mostly to the range of 35-45 mph. This is a common issue on GT series Vespas that has to do with tire wear. Or at least that’s the consensus on Modern Vespa. It’s not terribly disconcerting, but it’s something that seems like a brand new bike just shouldn’t do.